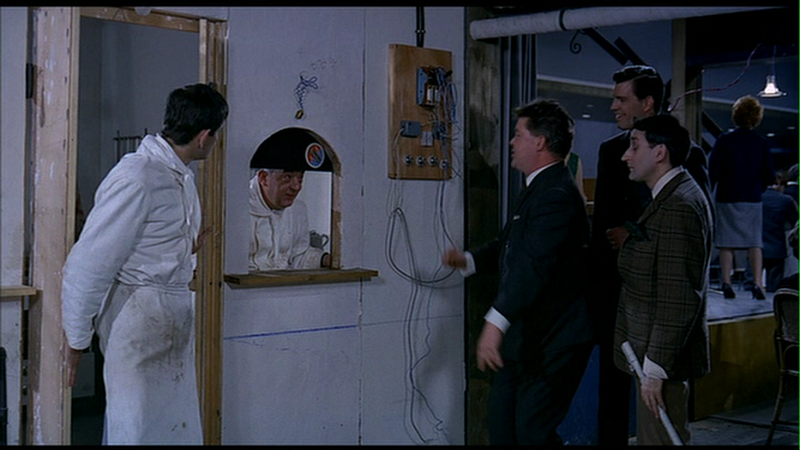 Playtime is a film justly celebrated for its amazing sets. Every scene is shot in a specially constructed mock-up of a hyper-modern Paris, all flat surfaces, gleaming floors and comfortless furniture. Much of this is realised using forced perspective (to make nearby buildings seem further away and thus larger) and photographed façades standing in for the fronts of some structures (and thus offering no reflections in their mirrored panels. The cast of extras is filled out with 2D cut-outs of large photographs of people. All of this artifice contributes to the sense of a city designed for aesthetic power and ill-suited for its human inhabitants. People are reduced to little atoms in a vast network of cubicles, box-shaped apartments, glass walls, elevators, pavements and identikit walkways. 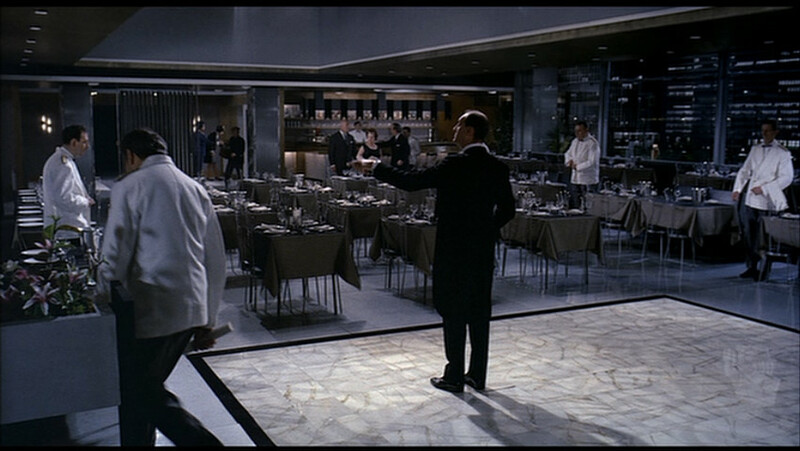 Gradually, the film shows them breaking out of the patterns and behaviours prescribed by their environment, most notably in the extended “Royal Garden” sequence (which Jonathan Rosenbaum called “the most formidable mise-en-scène in the history of cinema”). Over the course of this lengthy section of the film, the carefully planned and poised opening night of an up-market restaurant steadily devolves via breakage and collapse into a far warmer and more relaxed evening as people learn to accommodate the changes in plan and enjoy themselves. Their increasingly joyous dancing, and their refusal to sit or walk or stand where they’re supposed to sit or walk or stand represents a break from the straight lines of movement into which people are forced by architecture for the first half of the film. What starts out as a descent into chaos actually emerges as an evolution into something preferable, allowing a kind of Brownian motion of jiggling bodies and carefree crowding that confounds all of the management’s attempts to set up an environment that will keep everyone in check and conforming to social expectations. As is typical of Tati, when the socially constructed physical world begins to come apart and look less omnipotent and more malleable, the boundaries between human beings also begin to waver. People who would not ordinarily interact talk with one another, as the lines between social classes, as well as between work and play, blur and temporarily disappear. Amid shattered glass and crumbling walls, the space dedicated to consumerism and class exclusion takes on a utopian glow of equality and spontaneity in shared pleasure, a metamorphosis echoed in the film’s colour palette, which has slowly and subtly expanded into brighter and sharper hues during the Royal Garden sequence. The crucial catalyst for our appreciation of this sequence is the music, played by two successive bands and then sung by an old-fashioned chanteuse, who’s eventually joined by the customers – an element that helps us to cope creatively with Tati’s overload of invention by furnishing a rhythmic base to work from. Thanks to this music, each set of visual options has a rhythmic pattern for one’s gaze to follow while scanning the screen’s busy surface of swarming detail, through which we can join Tati in charting our own choreographies, improvising our own organisations of emphasis and direction in relation to the director’s massive ‘head arrangement’. What other movie converts work into play so pleasurably by turning the very acts of seeing and hearing into a form of dancing? Tati’s idiosyncratic use of sound has been much commented on. Since he shoots the entire film in long shot, often with crowded long-take compositions, the sound is an important tool for orientating the spectator. It might seem as though the spectator is free to roam the frame and focus on any detail that catches the eye, and to an extent this is true (each time I see it I notice something different and miss something I thought I remembered), but the soundtrack has been carefully arranged so as to emphasise certain elements of the mise-en-scène. Sound plays a key role in defining the spatial relations of a narrative film. The sensitivity to space that the listener exercises during a film is fundamentally one of locating the source of a sound in the space of the scene using cues of direction and distance. This construction of an auditory space borrows from our contact with the world at large. It is of some importance to be able to locate sounds indicating, for instance, danger (Is that a siren?) or to use sounds to help us decide where to direct our visual attention (What direction is it coming from?). The concept of auditory space applied to film is handy for another reason: just as the auditory space that surrounds us standing on a street corner must be largely inferred – it is the totality of all sound events perceived from all distances and directions, seen and unseen – the auditory space that we must construct from the vibrations of a theatre loudspeaker is also the product of the listener’s inferences. 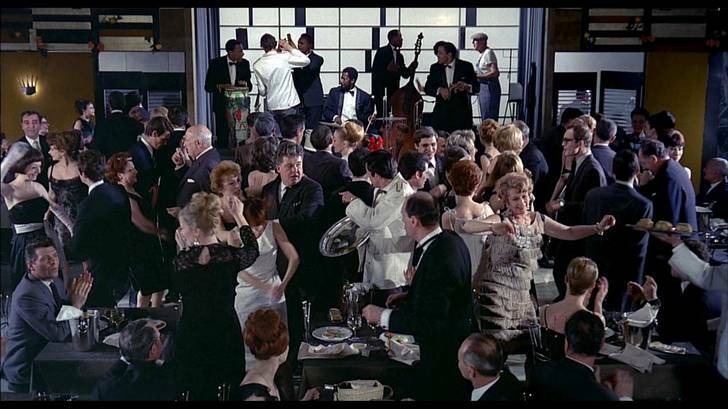 In classical film practice, location of a sound source is seldom an issue because the viewer’s construction of space remains consistent with the film’s causal chain of events. The notion of ‘sound perspective’ describes the manipulation of film sound, mainly through volume and reverberation, to correspond to shot scale. A close-up of a character speaking, for instance, will be accompanied by that character’s voice similarly centred for our attention. Noise coming from sources in the background, say, from figures conversing in the depth of the shot, will be comparatively muted and indistinct. The narrational function of such selection is obvious: the voice of the character relates information pertinent to the story without distraction from other sounds. Typically in classical films, then, the voice is the centre of attention, but in Les Vacances [and in Play Time, too, I would argue] Tati neatly reverses this. Sound techniques in the film help to defeat our expectations of a space at the service of the narrative, thanks primarily to what may be its most obvious sonic property, the lack of a dominant voice track. The wasp’s nest of cubicles conveys an incomprehensible space, tightly ordered but difficult to navigate due to its repetitious lines and colours. 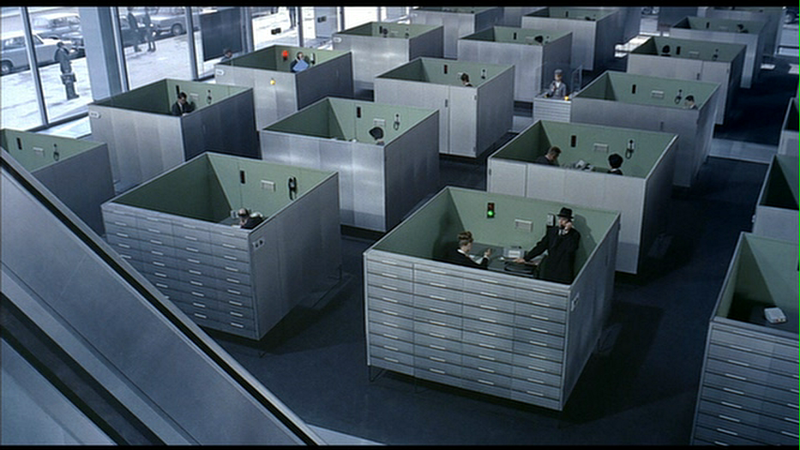 Tati’s Hulot can just be seen at the outer edge of the cubicles near the top left corner of the frame, struggling to locate the contact he is there to meet. The red and green lights pick out the important cubicles, as the occupant of one telephones someone in the other, but the soundtrack also assists with the orientation by singling out the speakers in the buzz and murmur of the vast rooms ambient sounds and business chatter. The depth cues are not realistic, but they direct the eye to relevant portions of the frame and keep the spectator one step ahead of Hulot’s mistakes and misunderstandings. 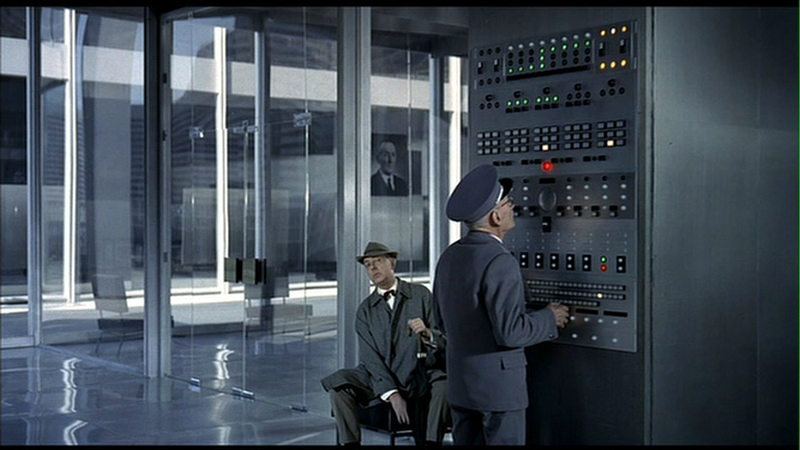 In another shot, Hulot waits for his meeting. As his contact approaches from the distant depth of the composition (see the figure in the background on the righthand side of the image below), the sound once again conceals the distance between characters. 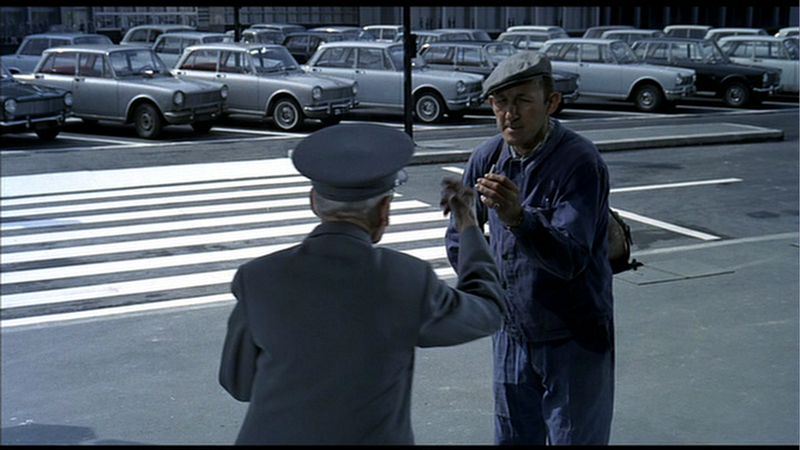 The footsteps appear close, and Hulot rises to the meeting, but he has been deceived, and he has much longer to wait. In a film by Tati, sound insists on making its presence heard. Creatures and objects emit sounds through little openings; some matter, when rubbed against matter, produces the voice of escaping sounds. These ‘farts’ – many sounds in a Tati film sound like farts – never reveal the volume, mass, or strength of the bodies that sound them. These are never more than localised sounds, torn from the ‘orifice’ of a particular source. […] Many have criticised these sounds for being immobile, for not moving along with their sources. Precisely, these noises are, first and foremost, placed to be heard in the specific shot where they appear. They must be totally fixed. Tati doesn’t even make the slightest attempt to simulate perspective by changing the position of these sounds. Through the uniformity and repetition of the physical spaces and the inhabitants’ activities, the apartment house sequence reiterates the sense of sameness and the consequent difficulty of differentiation which have characterised Playtime to this point. The notion of television viewing adds another layer of complexity to the situation by crossing the boundary into both the street outside and the spectator’s space, as the apartments with their television-screen-like windows make multiple channels of bourgeois family life available for potential viewers. All the ‘programs’ on view offer more or less identical scenarios which are doubtless repeated, with minor variations, night after night, a characteristic typical of television programming since its inception. The available channels attract no audience in the street, though, which is not surprising since such potential viewers would, for the most part, live the same lives as those they might watch. There are spectators, however, and Tati has slyly drawn the film’s audience into the same situation as the television-gazing apartment dwellers. We vainly search the interchangeable programs for difference and variation, while somnolence soon begins to set in as a reaction to so much repetition and banality. It is this privileged, voyeuristic perspective that lets the audience recognise the patterns and repetitions to which the city’s inhabitants seem to be oblivious. Tati’s compositions show how a different outlook can reveal hidden meanings and transform the experience of space, and this leads to what can be seen as a rather cheerful, optimistic conclusion. Playtime proposed a particularly euphoric form of re-engagement with public space, suggesting ways of looking and finding connections, comic and otherwise, between supposedly disconnected street details – not to mention connections between those details and myself. Indeed, these graphic similarities create confusion, but by the end, after the city-dwellers have transformed the Royal Gardens into a bohemian haven and the streets into a colourful merry-go-round, they gain clarity, and the beauty of the city can at last be seen by those who have navigated its visual mazes. If the overly cheery and rather pasted-on transformation of the urban environment fails in its lighthearted attempt at conversion to an optimistic attitude toward the modernist city, though, it is due to the convincing weight of the grey, wrap-around monolith of the film’s first half. When this presence changes from a looming, disorientating locus of shifting boundaries and identity confusion into a balloon-filled quasi circus, it is as if a powerful human character had undergone an unmotivated last-minute metamorphosis from a quiescent but ever-present monster into a cheerful sidekick who, underneath it all, really has the hero’s best interests in mind. 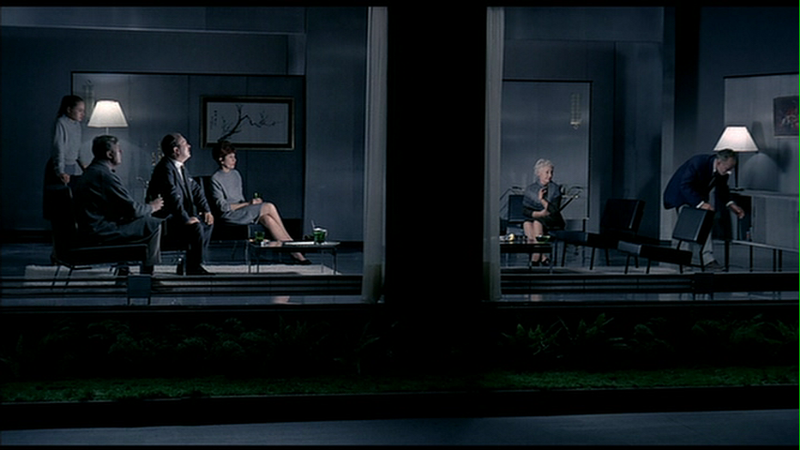 Not only does this seem as unlikely as a similar human about-face, but it also points up the fact that the mise-en-scène has become an all-encompassing, almost unnoticed, antagonist in the course of the film, while the very uniformity of the urban fabric, its complete lack of differentiation, has helped it slip effortlessly beneath the conscious attention of both spectators and characters. Playtime could be a dystopian vision of a world whose modern irritations are pestilential, maddening headaches of faulty gadgets and redundant babble. But he’s too generous and genial for that – instead he shows their absurdity, and then suggests how changes in perspective can defuse their power to confound. 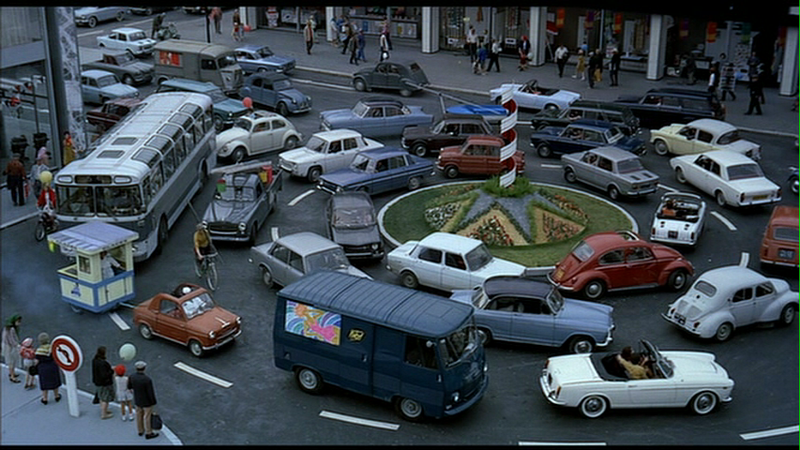 Michel Chion, “The Films of Jacques Tati.” Guernica, 2003. Lee Hilliker, “In the Modernist Mirror: Jacques Tati and the Parisian Landscape.” The French Review vol.76 no.2 December 2002. Donald Kirihara, “Sound in Les Vacances de M. Hulot.” Peter Lehman (ed.) Close Viewings: An Anthology of New Film Criticism. Review of the Criterion Collection DVD at DVD Talk Review. At Terri Meyer’s page for her Architecture and Film course at the University of Waterloo, some students have provided reviews of Playtime. Diane Skilton has a beautifully designed response to the film, as does Alana Young, but Tammy Chau’s goes the extra mile with an interactive site that lets you click on bits of Tatiworld to see relevant text and images. 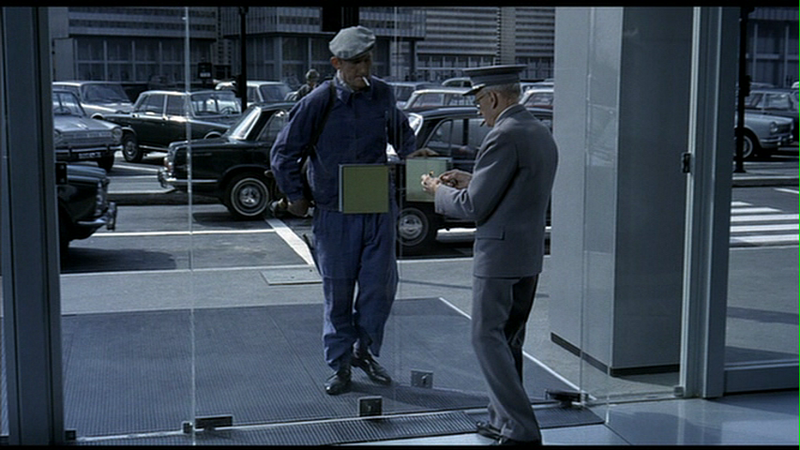 “Jacques Tati, Choreographer of the Human (Comic) Condition” at Tales of a Cinesthete. Jonathan Rosenbaum compares Playtime to another of my all-time favourite films, Jia Zhang-ke’s The World. And later, he puts it side-by-side with 2001: A Space Odyssey, another film I love, and which is a frequent reference point here at Spectacular Attractions. 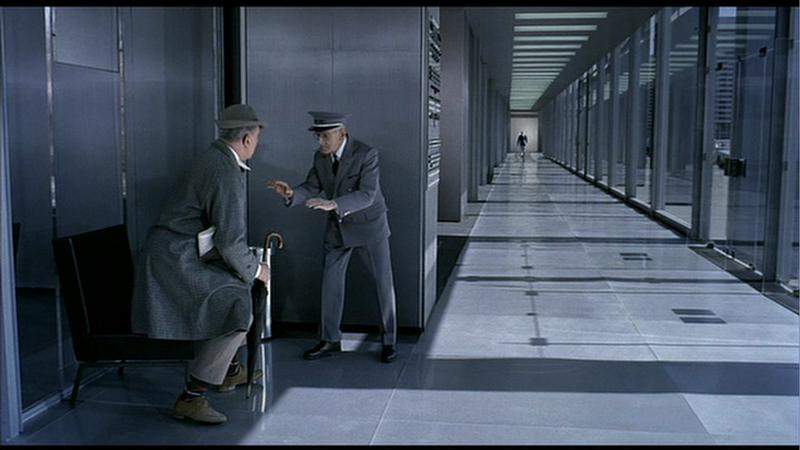 This entry was posted in Film Form and tagged film sound, Jacques Tati, Paris by Dan North. Bookmark the permalink. That interpretation of the ending is very interesting. Rather than seeing the ending of the film as an acquiesence of Tati the filmmaker that damages the film I feel that scene and the roundabout/carousel sequence before it shows another situation which people can either get more and more frustrated and upset by being caught in (and go insane through the frustration of it all), or can accept as a ‘fact of modern life’ and try to find the small human moments of connection and joy inside. All of the environments in the film have been designed to within an inch of their life by people who have specifically been given the job to order the place – whether it is an apartment, an office, a shop, a restuarant or the streets themselves. The architects are the only people allowed to make a permanent mark on the environment (even the chairs are designed so that they pop back into shape whenever a user vacates them!). One of the joys of the film is this monoform (to quote Peter Watkins) can maintain its indepdence from the rest of humanity as other people impose their own consciounesses on it and mould it in order to make their environment livable. This is similar to the workmen struggling with a pane of glass being turned into an Egyptian dance by the people watching on the street below. That is a small sliver of hope Tati provides at the end, and has been providing throughout through his comic comparisons of the clash between sterilie machines and biological, emotional humans – not that the architecture has mirrored the flowers but that the girl (and the viewer through Tati’s direction) has seen the flowers and that connection is then placed on to the motorway lights to give them in turn a resonance that their designers likely never intended. But that psychological resonance is part of what people do all the time when they remember a place fondly. Thanks again for your astute commentary, Colin. Much appreciated, as is your continued support on Criterion Forum. Yes, I think that’s right. Hence the film schooling us the audience in how to “see” the city. The people who are inside his compositions don’t see it from our privileged angle, so they might not notice the revelations that a certain perspective can create. Sorry that my comments here aren’t particularly well worded -I’ve been spoiled by the Criterion forum allowing me to edit my comments into coherence after the fact! Once again, excellent post. I am very happy to have stumbled onto your blog, Dan. Still halfway through writing on “Play time” (the first part of it is on http://scrapheap.info if anyone is interested, but be warned that it isn’t necessarily the tightest of pieces), but it might be worth pointing out that to read the ending as an affirmation of faith in mankind’s ability to subvert even the most rigid traps it organises around itself (and that much that was sterile and unlovely in hyperarchitected Tativille becomes playful and pretty once its function has been subverted) fits well with Tati’s often repeated discourses on the “democratisation” of the gag (i.e. no main characters, everybody has their moment on the spotlight, and beyond that, no particular thing happening at any given ruthlessly choreographed moment of apparent chaos taking precedence over any other particular thing sharing the same shot) and his steadfast populist stance (his efforts towards dissolving directorial orientation – not the same thing as presence, au contraire – so that the spectator is roused into taking active control of which amongst the several possible narratives he or she is following come from his desire for true interactivity in cinema, in other words bring it closer to a circus performance or country fair: something he did when covering for an ill Edith Piaf during her residency at the Olympia, by showing the recut “Jour de fête” as part of an actual fair assembled inside the theatre. It is all rather political; naïvely so, for sure, but political all the same. More specifically on the subject of sound-as-cue, I wonder whether you have seen Mike Figgis’s “Time Code”, and more pointedly his “live remix” during the Bowie Meltdown many years ago; and if you have (either version), what was your impression of the experiment.